The YJC Quintet recorded Intuition on October 11 & 12, 2014 in San Diego, with a special Release Event in the Village Area of Yuma Palms Regional Center on December 4. Six of the tunes were composed by trumpeter Steven Hennig, and one is by guitarist Carl Posch. The title track, with music and lyrics by Hennig, is sung by Yuma vocalist and music instructor Eloisa Arviso. Posch contributed an upbeat shuffle entitled Shut the Uffle Up. The other Hennig tunes are Late Night Taco Stand, a Latin tune with emphasis on congas, a brooding ballad Well Worn Sole, an up tempo Brazilian samba featuring drummer Brandon Coz titled Cozy Samba, laid-back swing tune called Let’s Remain at Large, and (She Is) Everything Plus, a driving, romantic Latin tune. Buy it now at CD Baby or iTunes! 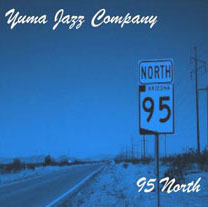 The YJC Quintet recorded Street Scene on June 12 & 13, 2010, once again at its recording 'home', Chaton Studios in Phoenix, AZ. This album contains 3 tunes by guitarist Carl Posch in addition to the customary Steven Hennig works. The CD title comes from the first tune, based on a New Orleans 'street beat'. The balance of the album contains a number of inviting styles - straight ahead to blues to Latin feels. On 95 North, the Quintet performs 7 new tunes by Steven Hennig, and produces a wide variety of satisfying 'feels'. Recorded on September 29 & October 1, 2006 at Chaton Studios in Phoenix, AZ, the album and title cut are named for the long, lonely, winding stretch of asphalt one takes when striking out for points North of our Southwest Arizona desert town. 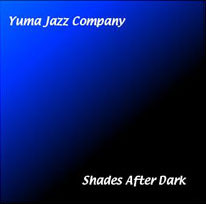 Shades After Dark, the debut album of the Yuma Jazz Company, is a collection of 8 originals by trumpeter Steven Hennig. It was recorded in two sessions in Phoenix, AZ, October 2004, and on it, the quintet covers a variety of territory: Latin, straight ahead, and Afro-Cuban.